IISView is a website statistics package for web hosts giving detailed web traffic analysis by analyzing your web log. Simple executable that can run every night and produce a simple set of static web pages representing the traffic seen on the web site. The web server supported is Microsoft's IIS. There are two main types of web analytics technologies. One uses embedded HTML tags to trigger counters, typically on a 3rd party site. This popular technique has some disadvantages such as requiring changes to your web pages, slowing down the page display as the links to the analytics are executed and sometimes fees to be paid to the analytics provider. IISView uses the other common technique of analyzing the web logs produced by the web server. These can contain information about the visitor, and how they came to visit your site. IIS records all hits on your site and can include time, URL visited and what page or site referred them to you. In the case of search engines this tells you what keywords the user keyed into the search query. In contrast to using a 3rd party page tagging, there are no monthly service fees. If you don't run your own IIS web server, then your ISP may allow you access to the logs. IISView can make use of remotely collected logfiles. If you don't have a way of accessing the web logs for your server, then IISView is not for you. Wikipedia has a section on Web analytics. IISView analyzes the logfiles produced by IIS and collates traffic statistics in various categories. Some logging features are not switched on in IIS by default, but these can be switched on easily in the "Internet Information Services" "Administrative Tool". Enabling referer, time taken and bytes sent in the logs make for much more effective analysis results. IISView will report which countries, and companies or service providers your visitors come from. IISView will identify the busiest time of day, or days of the month for your site, and identify when the response time you are providing to your customer becomes poor, or when your customers are experiencing errors from your site. There is a wealth of information in the IIS weblogs. IISView will help make sense of it all. Profile visits by hits, length of stay, entry/exit pages, non-robot. Here are some sample generated usage pages produced by the IISView analysis of actual web logs . Before you download, have a read of the instructions, since there is presently no wizard. Windows - 2000, XP(Pro), 2003 Server, Vista(Business/Ultimate), 2008 server. Administration privileges for installation and configuration, normal user for operation. run "Catch-up" to regenerate the preceding year's history. What you have downloaded is a WinZip self installer for IISView. Please Save and virus scan on your own system before "Run". Run the Self-Extractor part of the installer "Setup" / "Unzip"
Proceed with the install as below. 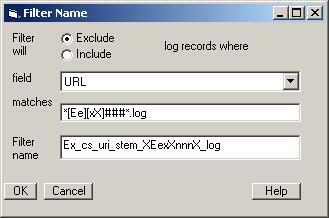 Select the WEB log type (For IIS run up Internet Information Services, select _the_ website, and click properties. The "Web Site" tab has an Active log format. IISview supports W3C format. Logging must be enabled. 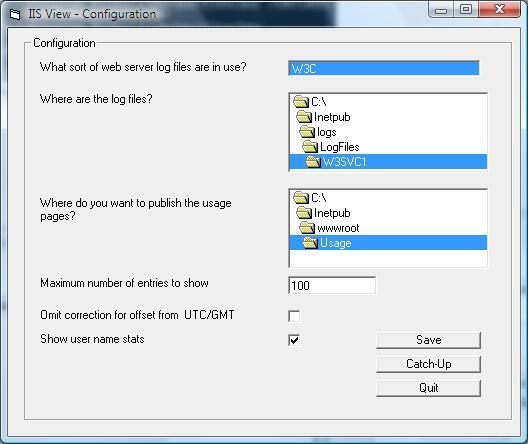 In IIS7 under Vista, the GUI for configuring the items logged is not provided. However there is an add-in available, Logging UI for IIS 7.0 on Windows Vista. Select the file location where "Log file directory" is found. Select the directory for the usage statistics to be published from. Simplest option is to create a directory under the "Home Directory" "Local Path"
However if you want to put it elsewhere that is fine, but you will need to create a "Virtual Directory" under the web site. (You will get errors if you don't create the standard directory initially, but after the first save all will be OK). Click "Catch-up" to process all the existing log files. Normally just this months files are processed. Progress is shown in the lower left section of the window. Check that the initial catch up has created a set of pages. You will be prompted for the username and password for the scheduled task to be run as. This should be you! Just let it run in the background under the scheduled task, and the usage web pages will be automatically updated. Remember if you change your password, then you have to go into all your scheduled tasks, like IISView, and updated the password in the task credentials. Special notes for IIS7 on Vista and Windows Server 2008. On Windows Vista (IIS7) the log file locations have moved and you will also need to enable read permissions for user executing the scheduled task. The log files are now in C:\Inetpub\logs\LogFiles\W3SVC1. This will have to be readable by the windows user running IISView e.g. Additionally you will have to set the permissions (or just ownership) on the Usage directory to allow read for web server, and full control for the user executing the scheduled task. The default IISView site is "INI". To add additional configurations, enter a site name and Add. Subsequently this site name will be available in the pull-down list, which you can then select. The configuration looks like above, but the site name appears on the Configuration label, event log trace, and in the title of the usage pages. Select the start and end days, month and year and press "Go". Progress through the report generation is shown in the lower left of the main configuration window. When complete, the report will be available in the Usage folder and named Custom.htm. Do not show the configuration window, and process the log records for the current month. This is used to perform the daily update. Do not show the configuration window. Update the usage reports with log files for the previous year. Select the site to be configured from the list of currently available sites, or a new site. Configure or process logs for "siteName" instead of the default site (INI). Display the version of IISView. Site reports can be customized to exclude log records, or include specific log records based on the values of the IIS fields. IISView looks at each record from IIS and applies the filter before adding to the statistics. On the main configuration window select "Filter out records". Press "Add" for a new filter, or delete or edit an existing filter rule. The filter name should describe the reasoning for the filter, but an automatically generated name is supplied if left empty. If you want to have reports with different filters applied or with no filters, use the multi-site facility. To be notified of new versions of IISView, receive an email when this page changes. All suggestions and bug reports should be submitted to David Horton. they aren't switched on in the IIS logging. Try enabling in Extended Properties in IIS. Refer to the Windows Application Event Log for diagnostic messages. the list size is configured large, and there are a lot of different visitors to the site. The reverse DNS lookup on each IP address is time consuming. (Try reducing the list size). On windows server 2008 the /BATCH overnight task reports errors in the Windows event viewer, but runs fine from GUI. Open the job in the task scheduler and confirm the password is current for the user. While there, change the "Configure for:" from "windows xp or 2003 server" to "Vista and Server 2008"
This is IISView. But if you host multiple web sites, IIS Farm View will track traffic, response times and error rates so you can see where to drill down.